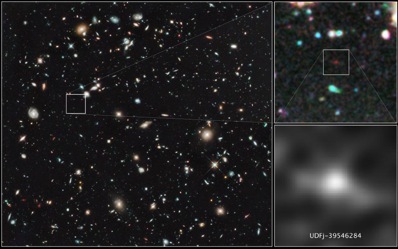 Ultra-deep imaging of the Universe conducted by the Hubble Space Telescope has uncovered a galaxy located 13.2 billion light years away, when the Universe was just four percent of its current age. The discovery beats the previous distance record holder by roughly 150 million light years. The galaxy, known as UDFj-39546284, is one hundred times smaller than our own Milky Way Galaxy, but represents the building blocks of today's giant galaxies. It is located at a redshift of 10.3 – redshift is a measure of how much the expansion of space has stretched the light from an object to longer (redder) wavelengths – equivalent in this case to 13.2 billion years. The 13.2 billion light year distant galaxy appears as a faint red blob in this ultra deep field taken with the Hubble Space Telescope. Image: NASA, ESA, G. Illingworth (University of California, Santa Cruz), R. Bouwens (University of California, Santa Cruz and Leiden University), and the HUDF09 Team. “We’re getting back very close to the first galaxies, which we think formed around 200 to 300 million years after the Big Bang,” says Garth Illingworth, of the University of California, Santa Cruz, who led the study with Rychard Bouwens and report their findings in this week's issue of the journal Nature. The research also uncovered a striking change in the rate of star formation – and number of galaxies – in the time period from 480 to 650 million years after the big bang, with the rate of star formation increasing by ten times, "an astonishing increase in such a short period," says Illingworth. The team also found only one galaxy at this vast distance, compared with 47 galaxies found at the later times, during a previous study. “The Universe was changing very quickly in a short amount of time,” adds Illingworth. But this observation is consistent with the hierarchical picture of galaxy formation that says galaxies grow and merge under the gravitational influence of dark matter. The galaxy was found during deep imaging of the Hubble Ultra Deep Field, in which Hubble's Wide Field Camera 3 focused on one tiny region for a total exposure time of 87 hours. It will take the next generation of space telescope, the James Webb Space Telescope, to confirm the galaxy at redshift 10.3 and push back to even higher redshifts. “It’s going to take JWST to do more work at higher redshifts. This study at least tells us that there are objects around at redshift 10 and that the first galaxies must have formed earlier than that,” Illingworth said.